Pretty much how most people end up in Lexington: horses. I’m the Operations Consultant for the Thoroughbred Aftercare Alliance. I have worked in racing my entire life, but the truth is that I’m really a tree-hugging, trail-climbing, granola-eating, pretzel-bending hippie! In this town of khaki pants and blue shirts, blue grass and stone walls I am a fish out of water. I like Bourbon, it’s good… but I prefer Chai. Riding a winner for my bff Kim Grahame. As I start this blog, it’s important to note that I’m a person who wants to TALK about horses, not necessarily WRITE about them. My abilities are limited to my 60wpm on the keyboard (less than half the speed at which I speak! ), so to all those smart, clever and sophisticated writers… any tips you care to share, I’m listening! Truly, I love horse racing – ALL of it. The Triple Crown, the sales, the Breeders’ Cup, the summer meets at Saratoga, Del Mar, Keeneland, Gulfstream Park in the winter, or Woodbine in the spring. I love the breeding farms, the foals, the stallions, and the roar of the crowd, the peaceful solitude of being the first on the racetrack in the morning, the people, the gamblers, the characters, the stories, the endless jokes and the ever-present race track optimism. And I love that it is all about, and because of, the horse. 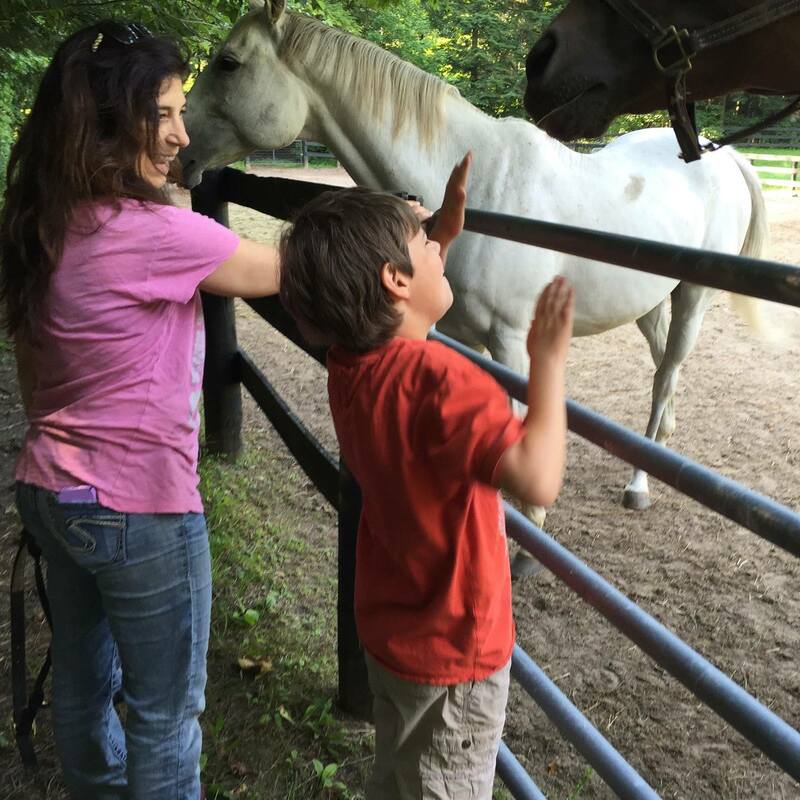 Horses make everyone feel like the future could be good. Countless “real writers” have immortalized the Thoroughbred racing spirit and the hope of what could be, and I feel that it is this unshakeable optimism that inspired what I believe is one of the best industry initiatives we have: the Thoroughbred Aftercare Alliance. The TAA is the only accrediting Thoroughbred aftercare organization in North America, and possibly the world. My friend Simon meets retirees Mark and Wiz. 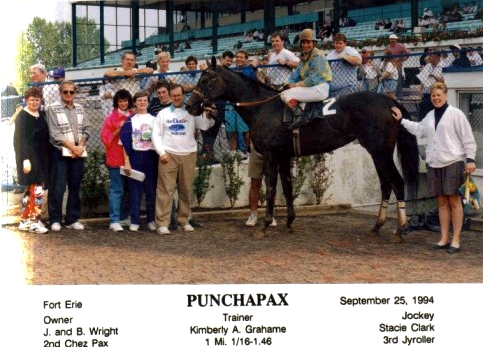 As anyone involved in the beginning days of the TAA will tell you, it started with a phone call from Jack Wolf, founder of Starlight Racing. I was managing a Thoroughbred retirement program outside of Toronto at the time when Jack called me – because someone told him he should. One thing about Jack, if he is curious about anything he will find out more, and aftercare for Thoroughbreds was no exception. To be honest, I couldn’t believe what I was hearing. Don’t get me wrong – I was delighted – but honestly, when you’re working at a farm up north, the last thing you think will happen is for someone from Kentucky to call you to talk about retired horses. Jack told me he was getting a group together to discuss Thoroughbred careers after racing and wanted to know if I would be interested in participating. Of course I was! That phone call turned into several and then to many meetings and many ideas. The first meeting was in 2012 at Belmont Park. It was the week of the Belmont Stakes and there was a formidable presence of many industry leaders at that first meeting, which continued throughout the following year. And not without disagreements or challenges, the TAA grew. Sometimes I wondered, as I’m sure many did, whether this sport and this industry could actually take on this feat and succeed. But the truth is, as many know, it has to succeed. Currently, the TAA has accredited 56 Thoroughbred aftercare organizations (with over 180 facilities). We are the only accrediting aftercare organization “out there” and that is a big deal to the investors and to the organizations we accredit. So far, we are a growing success story. How I ended up doing this from a small town north of Toronto is still puzzling to me. I have spent all of my life finding a way to be around horses, whether they are racehorses, show horses, ponies or work horses in India. 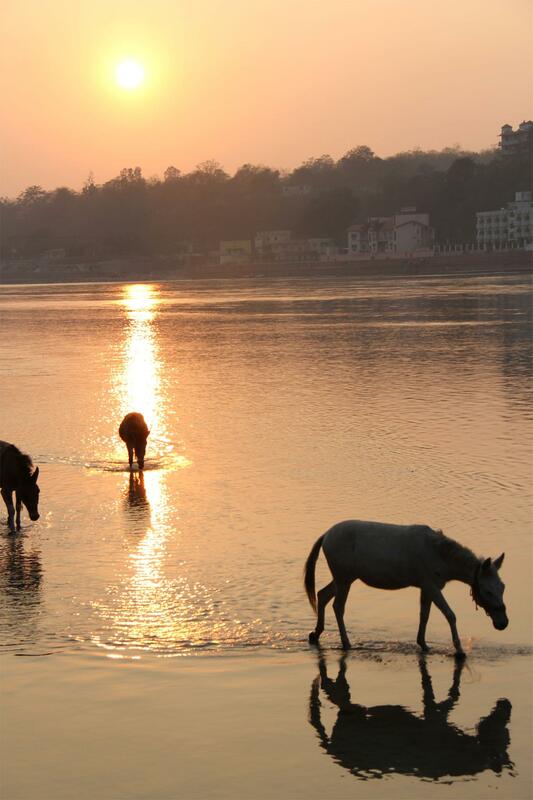 Horses relaxing at the Ganga in Rishikesh, India – where I went on a yoga retreat in 2013. I find horses the most fascinating and beautiful animals on the planet, and the Thoroughbreds are without question the most perfect horses. I am consistently blown away by their incomparable genetic characteristics, and their willingness and ability to do almost any job a horse could be asked to do. From prisons to show barns, therapy programs to comedy (Old Friends), the post-racing Thoroughbred is a bigger part of your community than you may imagine. That’s how I ended up here.